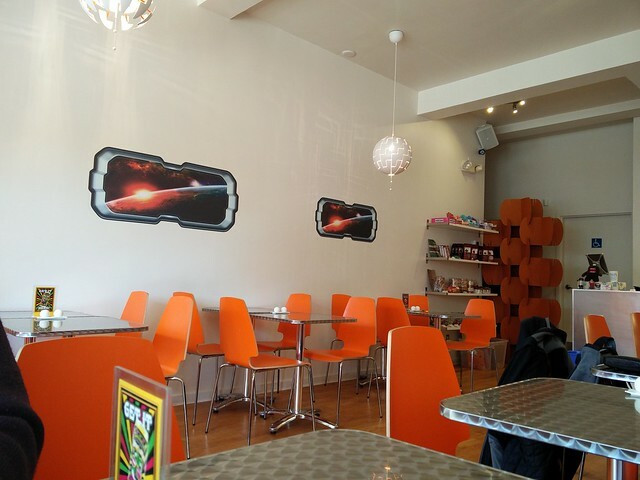 Brunch at Cosmic Treats, Toronto – vegan in your city. 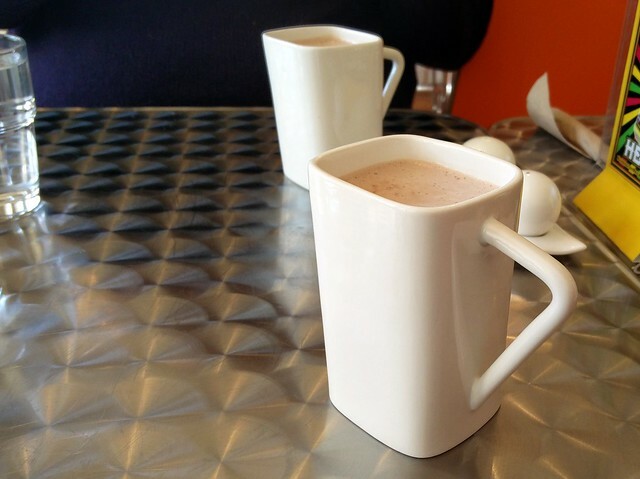 This weekend we finally checked out Brunch at Cosmic Treats. I haven’t been in there since they opened, but JC brought me a few of their baked goods shortly after they opened. and I liked ’em. But we decided to actually go and eat inside since they are so much more than a candy and ice cream shop. Kensington showed its friendly face to me in the street with a random stranger bullying me on the sidewalk. After that, I was ready to just go home and stay home for the day or week. But instead we walked into to Wanda’s Pie in the Sky and drank soy lattes while I pretended to read books for about two hours before Cosmic Treats opened for brunch. Cosmic Treats opens at 11:30 am, and we stood there like hungry cats in the rain (except there was no rain, and you should really keep your cats indoors at all times anyway) until a line up of other hungry people formed behind us. I considered scratching at the door, but resisted. They let us sit a bit sooner than they were ready, and the restaurant filled up steadily after the door opened. But frankly, I liked them a lot and I think they could be busier. 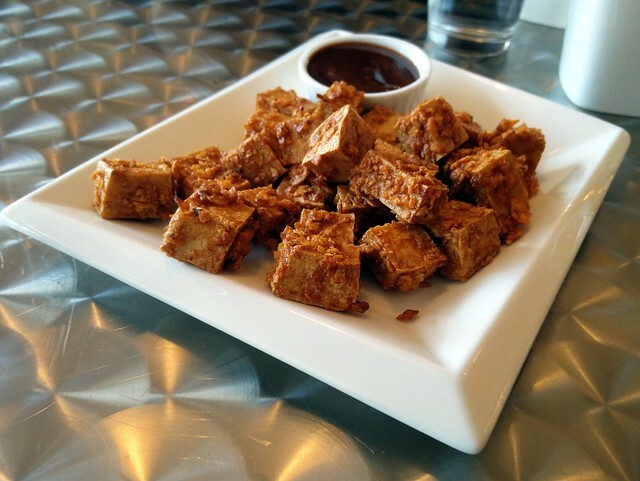 We started with a couple of hot chocolates with marshmallows and the Sweet Chili Heat Doritos encrusted fried tofu. Which was delicious as you might expect. It came with a bbq sauce. 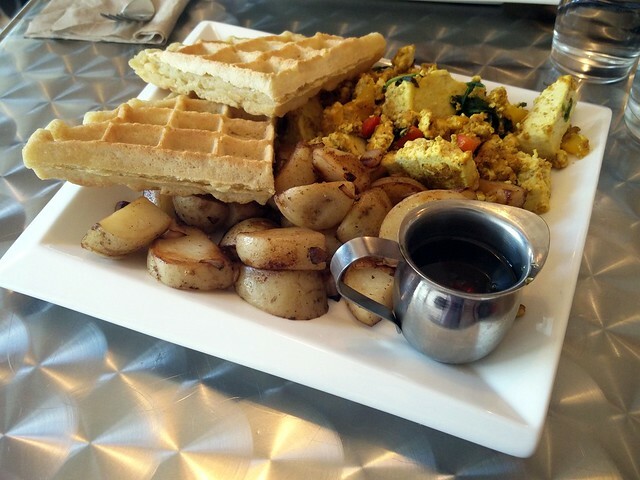 I ordered the All Day Breakfast, which comes with potatoes, tofu scramble, and your choice of cornmeal waffles or pancakes. I really really liked the waffles which came with a small but ample jug of maple syrup. I like my potatoes more roasted or mushy than what I received, and the scramble could have been more scrambled, but the seasoning was really great. 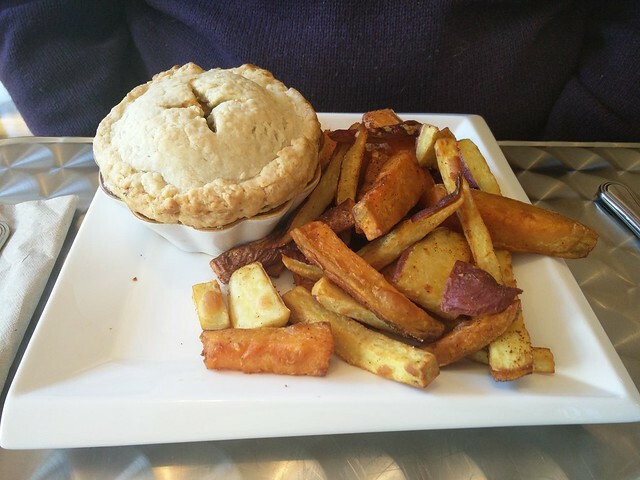 JC got the Chicken Pot Pie, and it seemed crumbly and delicious, but I only stole a few bites because I was too busy trying to finish my own massive plate. 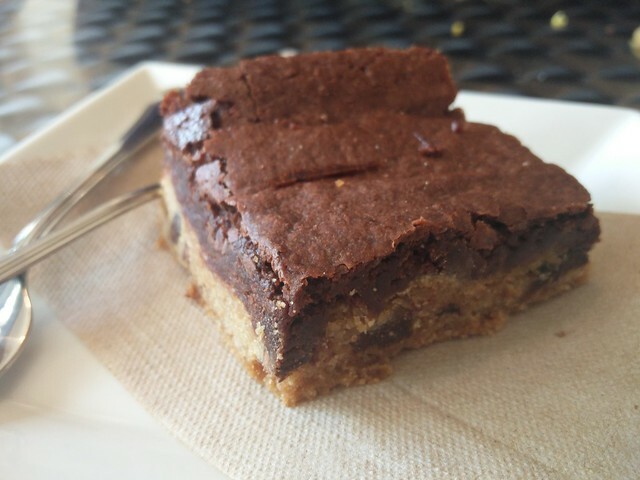 Finally, while we didn’t finish our breakfast – I still wanted dessert, so we shared a piece of the Brookie. Yes, that’s a delightful portmanteau of Brownie and Cookie. It was amazing, as you might expect. I also grabbed a few of their candies they’ve got in store – like Goldenbergs Peanut Chews (for anyone that’s been in Philadelphia, you know what I’m talking about), abba zabbas, the new seasonal flavours of cocomels, and some taffy. Service was friendly, helpful, and the interior is really fun. I would recommend checking it out, especially if you haven’t yet done so.